What does it mean to be genuine? Is truth obvious and measured or is it perceived through our own filters? Can the sublime and the ridiculous be real? “Bakersfield Mist” is a humourous, honest, and heart-felt story about sophistication vs. vulgarity and how we try to be true to ourselves. Full of passion and raw emotions, it is a tale of art and social class (all high and low) and the search for truth. It is also a lesson in that first impressions may not entirely be dependable. Maude (Nicola Cavendish) is a foul-mouth, unemployed middle-aged woman. She lives in a trailer home proudly decorated with junk and kitsch she procured from rummage sales. Among her “finds” is a painting that may or may not be a lost Jackson Pollock. Lionel (Jonathan Monro), an esteemed art expert, comes to visit Maude and assess the painting. What follows is a clash of classes, a heated discussion on the value of art, and poignant revelations on life’s sudden turns. The characters’ hilarious confrontations cut through the surface of superficiality to reveal the depth and complexity of two very different people. Curiously, their intentions with the painting may or may not necessarily be monetary. The play showcases powerful performances from the cast. Ms. Cavendish brings down-to-earth humour and compassion to a seemingly tacky character. Mr. Monro carefully peels away the layers of an arrogant man revealing a person who is trying to honour his experience and knowledge. Together the actors reveal the humanity that can be the common thread among people, regardless of age, gender, social or economic standing. 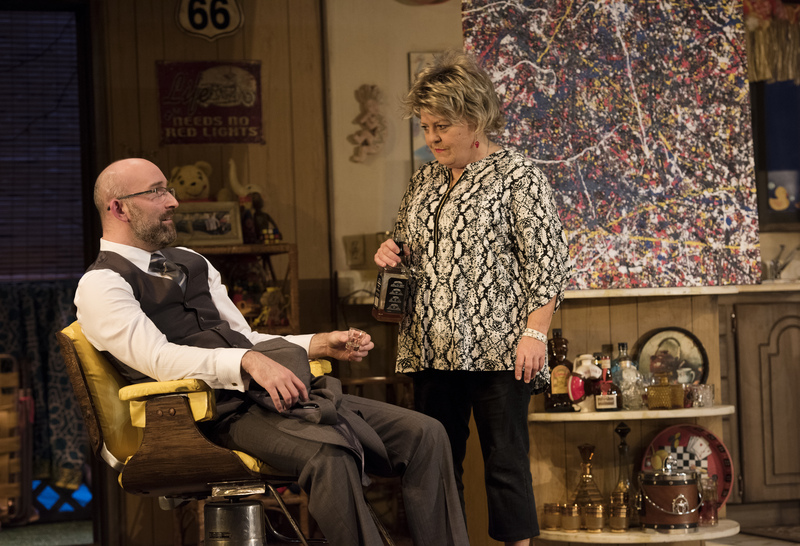 The set is a marvel of layered details- full of garage sale curios and odd bits that somehow all come together and gives the story of Maude’s life. It looks busy but it’s not without purpose. Vulgarity has its place; the refined too. But neither is an absolute stamp of quality. What is authentic to one person can be a matter of taste. Splashes of paint on canvas may just be nothing more than splashes of paint. *A piece of advice: be sure to come early in order to appreciate the set. It sets the tone for the show. (You can count how many chicken/rooster motifs are visible!). The Brooks bring the funk!